Do you live somewhere prone to drought? This may be considered a problem, but there are many different types of plants that survive, and thrive with very little water... you just need to choose the right ones! During prolonged drought, it is only natural for any garden to lose some of its plants. Many plants can withstand short periods of extreme dryness; they may wilt and parts of the plant may die back – leaving only parts of the root system and top growth alive. If conditions don’t persist these plants may re-establish the growth they had pre-drought. A much smaller range of plants can withstand prolonged dry conditions for months or even years. Drought tolerant plants are those that can survive these extended periods of dryness. Some countries (such as <st1:country-region>Australia</st1:country-region>, the <st1:country-region>USA</st1:country-region>) are more prone to drought than others; but even countries such as the <st1:country-region>UK</st1:country-region> experience periods of drought. With low water supply, water restrictions, and the prospect of being unable to water a garden as much as in the past; it is becoming increasingly important for gardeners to consider growing drought tolerant plants. During dry periods, plants will continue to metabolise (eg. chemical reactions and processes such as respiration and photosynthesis still occur). Some plants survive by slowing down their metabolism rate. Others may have a naturally slow metabolism which helps them survive. Others may have sufficient water stores in the plant tissues for the plant to continue living until the next rain comes. By looking at where plants come from we can often, make reasonable and educated guesses about what is or is not drought resistant. Fleshy plants such as cacti and succulents will hold higher than average stores of water and as such are considered drought resistant, to a greater or lesser extent (depending on the plant). Plants that grow in poorer, sandy soils are also often adapted to living with little water. Even after rain sandy soil often dries out quickly, leaving the plant roots sitting in very dry soil for extended periods. Soil dryness, either as a result of low rainfall or the soil’s inability to retain water. Poor water retention is common in sandy soils, on sloping ground, compacted soils, soils subject to surface crusting, and in raised garden beds or mounds. Some plants tolerate dry soil but not dry air. Some plants tolerate dry soil, and low humidity. Some plants tolerate periods of dry conditions but not all the time, ie. seasonal dry periods. Many plants prefer dry soil when growth slows down in cooler weather. Moist soil during cool, slow-growth periods can lead to root rot problems and lower the plant’s ability to withstand pest and disease attack. Some plants need moist soil to establish, but can then withstand dry conditions. Add water retaining crystals or a soil wetter. Deep watering using a soaker hose or sprinkler once/week instead of frequent hand watering. Potting mixes often dry out rapidly and need frequent watering, particularly in hot, windy conditions. Soils in terracotta pots are especially prone to drying out quickly. If you want to overcome this problem, use potting mixes which are specifically designed for terracotta pots – water retaining granules/crystals and peat are often added to the mix to improve water retention. Potting mix that is allowed to dry out is often difficult to re-wet evenly. Wetting agents can be applied to help improve water penetration (infiltration into and throughout the potting mix, helping to ensure the entire mass of potting mix is moist). Drip irrigation systems with individual drippers for each pot are also very useful in keeping the soil moist. The following lists provide just a few of the possibilities. There is a huge range of natives suited to dry conditions. Ask at your local nursery for natives suited to your locality. Not many trees are truly drought tolerant and most trees will need water during the first two years of establishment. However through careful tree selection gardens can be more resistant to droughts - a side benefit to this is that the garden also requires less maintenance (through time saved not watering). Trees native to an area better adapted to local soil, moisture, climate and pest problems. Trees with small leaves (linden, elm, ash, willow oak) are more efficient at cooling; they use water more efficiently then large leaves trees that lose more water through the evapotranspiration off the leaf surface ie. Liquidambar styraciflua (sycamore), Tilia heterophylla (cotton-wood). Trees growing on slopes are usually more drought tolerant then those growing on river-flats. Early colonisers (the first trees to re-colonise disturbed sites) such as wattles, pines, black locust elms (plants native to an area or sometimes those that have become weeds to an area), use water more effectively than those that are later colonisers (that tend to grow once the first colonisers have stabilised the area). Trees that have wide spreading crowns are not as efficient in water use as those that fastigiate (upright crowns). Trees that have layered branches in their crowns (such as oaks, ash, eucalypts, willow oaks etc) are more water efficient then those that only have a leaf canopy. Trees with large root systems, thick waxy leaves and bark and efficient stoma control are water efficient trees eg. many eucalypts, red cedar). Trees that are not drought tolerant tend to shed their leaves during prolonged dry conditions (eg. birches, dogwoods etc.). Wormwood, southernwood and tarragon are all commonly grown Artemisia. Some Artemisia prefer regular watering; but many are also relatively drought resistant. Approximately 200 species of herbs and shrubs; some species are grown as herbs for culinary, medicinal or other purposes (eg. the aromatic foliage of most will repel some pests). They are hardy and grow fast. Most have aromatic foliage; leaves can be entire lobed or dissected, and very often coloured silver to blue or grey green. Most are attractive as bedding plants for foliage effects (colour or texture), some are also good as a hedge or container plant. Most can be are picked as cut flowers. A mixture of silver leaved Artemisia (often with lavenders) can be used to create a stunning foliage effect in any size garden. They are popular plants to use in colour themed gardens. Artemisia thrives in poorer, dry soils, but excessive humidity or wet soil can kill most. They grow well in full sun or light shade, in open, exposed or protected positions. Transplant easily, propagate readily from cuttings, withstands hard pruning, prune for shape. Few pest or disease problems, though they can suffer root rots occasionally. Yellow flowers, attractive grey-green and soft fern like foliage, can become straggly if not pruned regularly. Very hardy, greyish foliage, yellow flowers. Silver grey foliage, more silvery in spring. Bromeliads are grown mostly in mild temperate through to tropical climates. Though they do respond well to watering; many Bromeliads will survive for long periods of time on very little water. Bromeliads can be grown in containers, on tree trunks or slabs as epiphytes or in well drained, preferably high organic soil. 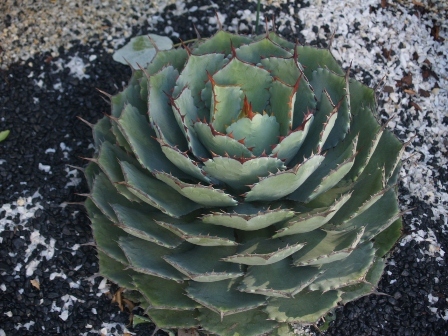 They are generally low growing rosettes, grown for their colour (flower and foliage), hardiness, and unique form and texture. 8 species - all with spiny leaves; A. comosus (the pineapple) is the most widely grown, both as a commercial crop and in home gardens; hardy in well drained but moist soil; takes up to 2 years to bear fruit. 61 species, foliage generally taller, tubular and with less leaves than other bromeliads, stalks bearing tubular flowers spring from the centre of the plant, very hardy, tolerate full sun. 42 species, medium size plants, flowers red, white or blue, leaves have fine spines. Plant size can vary considerably, Difficult at high altitudes, most gave bluish tubular flowers. Approx. 290 species, very adaptable though commonly native to tropical rainforests, ideally part shade, spineless leaves, cold tolerant, foliage variable in texture and colours. Most Brachychitons are relatively drought hardy. Appearance: long-lived, generally slow growing trees and large shrubs; often have swollen trunks. Flowers: some shed foliage prior to flowering, clusters of bell shaped flowers followed by large woody seed pods. Requirements: tolerate poor soil, prefer fertile deep soil, avoid waterlogged soils. Warm climates preferred; once established will withstand dry periods. Culture: may be pruned to shape. Good drainage is essential for some species. Propagate with seed collected from current season’s capsules. These may take several months to germinate. Pest and Disease: some subject to leaf chewing insects. Open medium shrub to 5m with hairy red new foliage and red flowers. Maple shaped leaves. Well adapted to a range of soil types and climatic districts. A tree to 30m, with pink flowers, and maple-like leaves. Deciduous in cooler areas. Semi deciduous 10-15m tall, greenish yellow flowers with brownish spots inside, slow growing, adapts to most well drained tropical sites. A deciduous tree with yellow flowers with red margins. Small tree 3-6m tall, spectacular red flowers, grows well in semi arid tropics in a sunny position. An adaptable tree to 18m, with poplar-like leaves. Hardy in most soils, but prefers lime soils, flowers white to green-yellow sometimes with reddish inside. 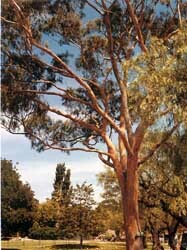 A large tree to 15m tall, with a swollen trunk. A good fodder tree. Olives are one of the better fruiting trees to grow in low rainfall areas. They do respond to watering; but also prefer a drier climate, and in fact do well in much drier conditions than most other fruit trees. Appearance: evergreen trees or shrubs with foliage usually silver-white underneath. Flowers: small, white flowers in panicles. Features: source of olives and olive oil. Requirements: deep, fertile, well drained soil. Dry conditions best, but the olive is very adaptable. Culture: commercial growers may require a combination of varieties to improve pollination and yield. Olives have a high cold requirement ‑ as much as 1500 hours or more, depending on the variety ‑ and this will greatly affect flower production. The trees will not tolerate water-logging, so good drainage is essential. Cropping will tend to follow a biennial pattern under good conditions, as a heavy crop will tend to inhibit flower production in the following year. For this reason (and to produce good sized fruit), proper thinning is important. The variety `Sevillano' appears to be an exception to this rule. Olives tend not to grow too well in the tropics due to humidity. Pest and Disease: brown Olive Scale is the main problem. Weevils, Peacock Spot fungus, Crown Gall and Nematodes, are occasional problems or localized to particular areas. (Olive) – is an extremely hardy, long-lived tree with almost legendary drought tolerance. Trees are occasionally seen as garden escapes, even in cooler areas. It has a preference for Calcareous soils and can tolerate steep slopes with shallow rocky soil. Of course, the best crop production will come from far less harsh situations. The trees are long lived, wind pollinated and requiring about 8 years to come into production.Plants are normally spaced at about 10m and pruned to an open vase shape to keep them as low as possible. Subsequent pruning is only to maintain this shape. Heavy pruning may reduce yields and encourage the development of suckers, and so should be avoided. Propagation is generally by budding or grafting onto seedling stock, although root grafts, semi‑ hardwood and hardwood cuttings are also successful. The following lists are trees and other plants that will tolerate drought or dry conditions once they are established. A medium sized tree with weeping branches and narrow leaves. Tolerates medium dry conditions for cool temperate districts. Some success is achieved in Brisbane localities. Dwarf and variegated cultivars are available. Now available is an attractive new cultivar ‘After Dark’ with blackish leaves. Rough, corky bark and reddish fine leaves. Tolerates dry, wet and cool conditions. Medium tree with milky sap and small yellow flowers in spring. Good shade tree for drier districts. Medium to large tree. Mature trees have twisted, gnarled trunk and branches. Needs well drained to dry soil. Hardy tree with dense rounded crown. Tolerates very dry soil and cold conditions. Rarely over 6 m in cultivation. White ivory flowers are produced in summer. Narrow conifer-like tree. Tolerates dry, arid conditions. Large shrub or small tree. More variable and open habit compared to other Callitris. Tolerates very dry, arid conditions. Small rounded tree with white flowers and edible fruit. Untidy when young but very handsome and mature. Good for dry areas. Medium tree with semi-deciduous habit. Pendulous yellow-red flowers in spring. Very hardy to dry sites. Good inland dry tree with spreading and pendulous branches. Spreading deciduous small to medium-large tree. Purple and white flowers. Tolerates medium-dry conditions. Small pendulous tree to 8 m with silver stems and large pendant pink flowers. Small bushy tree with large red bell-shaped buds and red flowers. Small to medium tree to 15 m with red flowers. Small spreading tree to 8 m with profuse pink flowers. Very large diverse genera with tall trees to small ground hugging plants. All are very tolerant of very dry conditions. orange spikes. Needs very well drained soil at all times. hardy in a wide range of conditions including dry soil. Rounded shrub to 2 m with 10 cm tall yellow-brown flower cone. Well adapted to dry sites. Variable shrub to small tree with many highly attractive cultivars. forms may be susceptible to frost damage. type flowers. Tolerates medium-dry conditions. to dry soils and low air humidity. Variable shrub to 2 m with narrow leaves and red spider flowers. groundcovers. Very hardy in dry and cold conditions. reddish-coloured flowers are borne on old wood in winter. established in a sunny, well drained position. branches and yellow and red pea flowers. Very hardy in dry soil. Erect bush plant to 2 m with red flowers. Will tolerate a wide range of dry soils. Tall spreading shrub to 5 m with white bottlebrush flowers. Medium shrub to 2 m with small mauve bottlebrush flowers. flowers. Tolerates very dry soil. Medium sized shrubs that require excellent drainage; low humidity. Species come in a range of flower colours. without any supplementary irrigation. Can grow up to 6m but usually only 2-3 m tall. Variable group of natives with yellow puff-ball flowers - mostly scented. Tolerant of very dry conditions. Kangaroo paws are well known to be perfect for dry and low humidity areas. Erect shrub to 1.5 m with grey leaves. Very hardy in hot, arid conditions. Variable shrub to 1 m with bright green narrow leaves and white or pink star flowers. Tolerates medium-dry conditions. Rounded shrub to 2 m with yellow flowers. Tolerates warm and very dry conditions. An attractive bushy, shrub to 2 m tall x 1 m wide, with showy, tooth-leaved foliage, and attractive heads of bright yellow flowers in spring. Needs a semi-shaded, well drained position. Probably the best Dryandra species for the eastern states. Variable shrub to 2 m with yellow, pink or red spotted flowers. Very hardy in dry conditions. Rounded shrub to 1-2 m with white star flowers. Hardy in a range of conditions including medium dry soil. Rounded shrub to about 2 m; greenish-yellow or red flowers in early winter and spring; needs a sunny well drained site. Small native with variable forms mostly with white of pink flowers; needs well drained location. Small spreading shrub with silvery branches and leaves. Erect shrub to 2 m with sprays of white bearded flower. Tolerates dry soil but can be difficult to grow in the garden. Rounded shrub to 2 m with grey linear leaves and white flowers. Very hardy in a range of conditions including very dry soil. Low growing plant with daisy flowers. Good for part sun to full sun sites in low rainfall areas. Excellent ground cover form of this species likes dry well drained soils. Variable group of Grevilleas from Western Australia that require full sun and well drained soils. Spreading shrub/ground sprawler with white honey-scented flowers and sharp three-lobed leaves. Needs excellent drainage and low humidity. Highly ornamental hybrid with attractive foliage and flowers. Likes well drained soils and can tolerate medium rainfall. Prostrate woody plant with feathery white flowers. Tolerates very dry conditions. Prostrate plant to low shrub with long trailing stems and white star flowers. (Yellow Buttons) – semi-erect herbs with yellow globular flowers and greyish leaves. Prefers dry sites. Growing as a groundcover or climber this plant produces deep mauve flowers or slight colour variations. Prefers full sun to part shade and tolerates low rainfall. Hardy climber growing well in part shade. Slow growing in very dry sites. Deep blue flowering slender climber adaptable to most soil conditions.